The Modern Gooner: An Arsenal Blog: No Chambo, no result; why lack of faith in Chamberlain borders on insanity. No Chambo, no result; why lack of faith in Chamberlain borders on insanity. It's the question that we all seem to be asking ourselves these days isn't it? After a fantastic showing midweek against Galatasaray in the 4-1 rout, Alex Oxlade-Chamberlain was yet again dropped to the bench - it's a sequence of events that has become all to familiar at Arsenal these days, and truthfully, it needs some addressing. 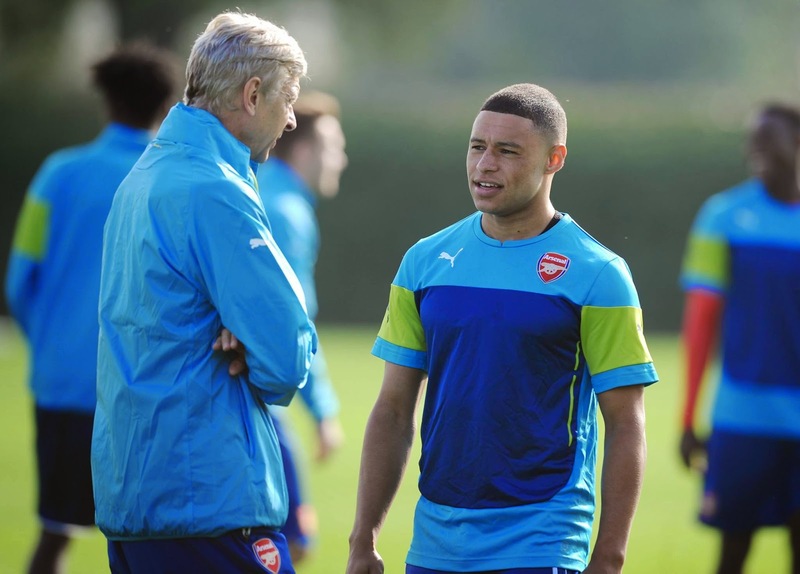 Perhaps it's a bit ironic that Chambo goes by the nickname of Ox, or "the Ox". But if you were to look at the definition of what an Ox is, maybe it all starts to make a little more sense. According to Merriam-Webster, that wonderful company that gives us ye olde dictionary, the second full definition of Ox is, and I quote, "an adult castrated male domestic bull" - could there really have been a more appropriate explanation for the state of affairs surrounding the England wide man? To say that I (and many others) are seething that not only did Ox not feature from the off, but also that it took Arsene Wenger 68-minutes till he brought him on, is a massive understatement. Time and time again, Le Prof tries to force build-up play and possession against our opponent no matter who we are up against, but it's not a shock that it just will not work against a Chelsea side that are experts are soaking up pressure and then breaking instantly to hit you where it hurts the most...the scoreboard. Perhaps it is telling that Chelsea were not firing on all cylinders yesterday by any means, but still comfortably won 2-0 on the back of two moments of magic; first Eden Hazard's brilliant run which ended in a penalty which he converted, and then a superb ball over the top from none other than Cesc Fabregas to put Diego Costa through to calmly chip in the second - this is how it's done, but it's mind boggling how Wenger has not learned this lesson. Sean will no doubt have done a brilliant job to put the match in perspective in his review, but this is about Ox, and more importantly, why his inclusion in the XI is what was necessary yesterday (and on so many other occasions). While I am incredibly active on Twitter (especially during matches), two tweets stood out to me the most via people that I constantly discuss football with; the first comes from @UFGoonerAJ "You're not going to complete 20 pass sequences for goals against top teams like Chelsea. The attacks have to be quick, fluid and direct. ", while the second comes from @GurjitAFC "No cutting edge. Even Leicester created more at Stamford Bridge than we have." - honestly, could there be anything more telling from those two opinions? We needed Ox yesterday, simple as. While on paper an attacking force of Santi Cazorla, Mesut Ozil, Alexis Sanchez and Jack Wilshere all in support of Danny Welbeck is strong, on the pitch it does not mean much when everyone deploys tactically in a fashion that plays right into Chelsea's defensive strengths. With Ivanovic, Cahill, Terry and Azpilicueta at the back supported by Matic and Fabregas in midfield, there is no feasible way that slow build-up and possession is ever going to break that down. What was needed was pace on the wings, directness, and someone to give the Chelsea back line a moment of pause and something else to consider...that person was Ox. Not only does Chambo bring a brilliant bit of work on both sides of the ball, but his pace and willingness to always get forward and take on defenders is exactly the type of distraction to bring to the table against Chelsea - it also would have given Ozil and others more space to operate. When you have a player willing to run and stretch the defense, you create space in other areas, especially centrally...just look at the runs by Hazard all match long. God bless Cazorla (at times, anyway), but yet another attacking player who wants to slow us down is never going to have Chelsea (or any other decent side) reaching into the bathroom cabinet for the Aleve bottle. Truth be told, while it does get tiresome berating Wenger and questioning him week in and week out (despite there being ample evidence supporting such action), it's become clear that he has no idea what our best XI actually is, or that he fails to realize that our first-team is now built to counter rather than possess the ball and build up play. Is it not the job of the manager to get the best out of his players by deploying them in a fashion that allows them to maximize their effectiveness? The most frustrating part of all when it comes to the lack of faith in Chamberlain is the fact that, once Walcott comes back to full fitness, the time Ox see's will diminish even further. With Cazorla likely to be dropped to the bench in favor of Sanchez and Walcott on the wings, this period we are currently in was Chambo's best chance to really make his mark this season, but it seems all too likely that he won't be given that chance to show his worth. It's perhaps a bit ironic that despite his lack of real time on the pitch for Arsenal, that Chambo is still consistently picked for the national team. Roy Hodgson certainly has plenty of his own set of shortcomings, but at least he still recognizes just what Ox brings to his side, something that Wenger seemingly routinely forgets. Whether it is stubbornness and refusal to abandon his beloved style of play that he continues to champion despite being in a league where all other top teams thrive with quick and incisive football, or if it is faith in the wrong players (i.e. Cazorla being used as a winger when he's not a winger in the first place), it's a shame that a player so capable of living up to his nickname will rarely if ever get a chance to prove the nickname correct...the part about being able to work hard, have value and able to be trusted, not the part about castration.